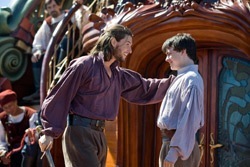 “Dawn Treader” update – I Commend Joy! I am glad to see that someone is keeping me (and my family) up to date on the progress of “The Voyage of the Dawn Treader” movie. I was specifically interested to see whether they were “getting it right.” The quotes at Ray Fowler’s blog seem to indicate that they are. Read the whole post at rayfowler.org, and his links to the other articles. I am encouraged!